Flood warnings in effect for Wyandotte County; today’s weather to be sunny and 58 – Welcome to Wyandotte Daily! 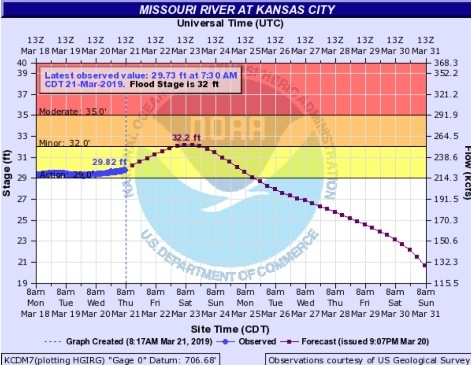 Flood warnings remain in place for Wyandotte County as water entering the Missouri River in the Dakotas makes it way to the Kansas City area this week. Dry conditions today will not compound local river flooding through Friday, however, water from levee breaches re-entering the river upstream may aggravate already swollen and flooding rivers and streams, according to the National Weather Service. Areas upstream from Kansas City, including St. Joseph, Missouri, Atchison, Kansas, and Leavenworth, Kansas, are continuing to flood. The rivers here now are expected to crest on Saturday, according to hydrology charts. Local emergency officials have stated that no residences in Wyandotte County are expected to be flooded. It was 39 degrees at 9 a.m. Thursday, with a high of 58 expected, the weather service said. Weekend rainfall here from a quarter-inch to a half-inch are not expected to affect flooding, according to officials. 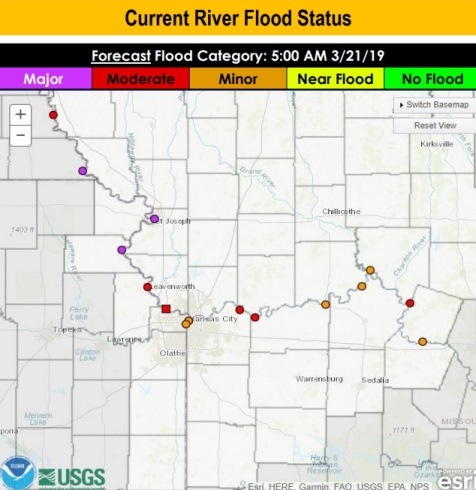 The flood warning for the Missouri River above Parkville, Missouri, which includes Wyandotte County, will be in effect until Friday, March 29, according to the weather service. The river is currently in moderate flood stage, and is expected to crest on Saturday. The Wolcott levees in western Wyandotte County are at risk. According to the weather service, the river above Parkville was 30.2 feet at 8:45 p.m. Wednesday, and 30.47 feet at 7:45 a.m. Thursday. It is projected to rise to almost 33.7 feet by Saturday morning. The Wolcott levee sections could overtop at 32 feet and 32.5 feet. 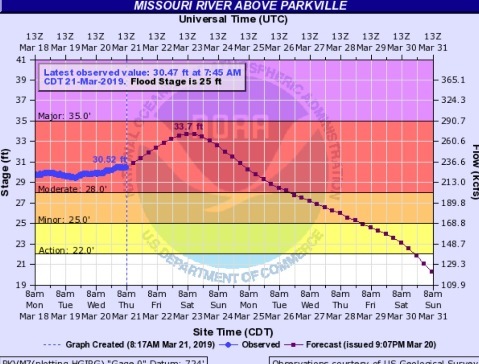 The river above Parkville is projected to fall below flood stage on Thursday, March 28, before midnight, according to the weather service. 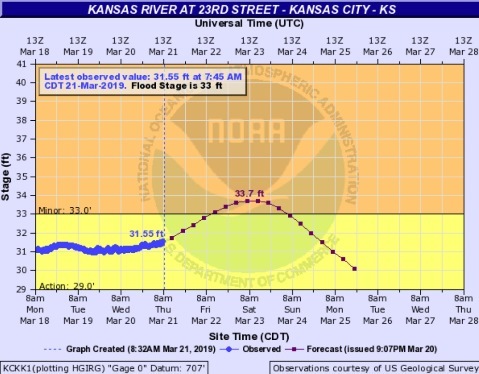 Wyandotte County also will be under a minor flood warning for the Kansas River at 23rd Street from Friday morning to late Sunday night, according to the weather service. This river gauge is at the east side of Kansas City, Kansas, on Kansas Avenue at the state line, connecting with Kansas City, Missouri, near the American Royal. At 8:45 p.m. Wednesday, the Kansas River stage at 23rd was 31.4 feet, and it was 31.55 feet at 7:45 a.m. Thursday, with flood stage at 33 feet. The river is expected to crest at 33.7 feet by Saturday morning. At 33 feet, undeveloped woodland along the river and outside of levee protection is flooded, with no flooding expected behind the levees. 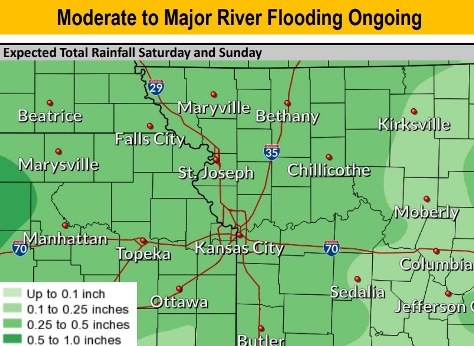 A minor flood warning also has been issued for Wyandotte County from Friday evening to Sunday evening for the Missouri River at Kansas City, according to the weather service. This river gauge is south of the downtown Kansas City, Missouri, airport, near the City Market, and not far from the state line. It is not far from the Kaw Point area. The river at this point was at 29.5 feet at 8:30 p.m. Wednesday, and 29.73 feet at 7:30 a.m. Thursday. It was projected to rise to nearly 32.2 feet by Saturday morning. At this point, flood stage is 32 feet. At 32 feet, minor flooding outside the levees occurs. Residents are warned not to drive through flowing water. Nearly half of all flood fatalities are vehicle related, according to the weather service. As little as 6 inches of water may cause you to lose control of your vehicle. Two feet of water will carry most vehicles away. For more weather information, visit www.weather.gov/kc/. Today, expect sunny skies with a high near 58 and a north northwest wind of 5 to 8 mph, the weather service said. Tonight, it will be clear, with a low of 34 and a north wind of 5 mph becoming light and variable, according to the weather service. Friday, it will be sunny with a high near 61, and light and variable wind becoming east northeast 5 to 7 mph in the morning, the weather service said. Friday night, it will be partly cloudy, with a low of 38 and an east northeast wind of 7 mph, according to the weather service. Saturday, showers are likely, with a 70 percent chance of precipitation mainly after 1 p.m., the weather service said. It will be mostly cloudy with a high near 56 and a southeast wind of 7 to 10 mph. Saturday night, there is a 60 percent chance of showers, with thunderstorms also possible after 1 a.m., according to the weather service. It will be cloudy, with a low of 48. New rainfall amounts of between a tenth and quarter-inch are possible. Sunday, there is a 50 percent chance of showers and thunderstorms, with a high near 64, the weather service said. Sunday night, there is a 30 percent chance of showers, with a low of 45, according to the weather service. Monday, there is a 40 percent chance of showers, with a high near 53, the weather service said. Monday night, it will be mostly cloudy, with a low of 33, according to the weather service. Tuesday, it will be sunny, with a high near 53, the weather service said. Tuesday night, it will be mostly clear, with a low of 40, according to the weather service. Wednesday, it will be mostly sunny, with a high near 63, the weather service said. To see an earlier story, visit http://wyandottedaily.com/flood-warnings-in-place-for-wyandotte-county-homes-not-expected-to-be-in-any-danger/.